In 2016, over 800 people died in Kentucky motor vehicle accidents and thousands more were injured. After a serious accident in Kentucky, time is not on your side when it comes to protecting your legal right to recovery. The insurance company is immediately working to minimize your claim. You need to talk to someone you can trust. 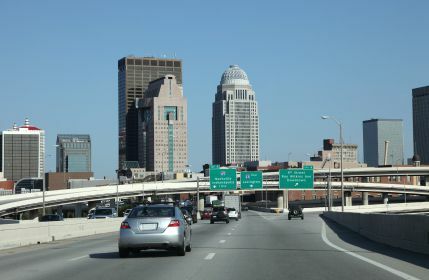 Our Louisville car accident lawyers have over 70 years of combined experience representing victims of serious accidents and have successfully gone up against some of the biggest insurance companies in Kentucky. Our firm has the resources, investigative skills, and trial experience that you need on your side to protect your right to the best possible recovery. Distracted drivers. Any time a driver takes his eyes off the road, his hands off the steering wheel, or his concentration away from driving safely, the driver is distracted and may cause a serious crash. Kentucky has some laws to prevent against cell-phone–related distracted driving accidents, but not all distractions can be prevented and serious crashes still occur. Drowsy drivers. Hundreds of people are killed and tens of thousands of people are injured by drowsy drivers in the United States each year. Tired drivers can be just as dangerous as distracted or drunk drivers and should be liable for the injuries they cause. Drunk drivers. It is against the law to drive with a blood alcohol level of 0.08 percent or higher in Kentucky. Yet each year people are killed and hurt by intoxicated drivers. Speeding drivers. Drivers who exceed the speed limit or who drive too fast for road conditions may be unable to stop in time to prevent a crash. Aggressive drivers. Aggressive drivers may weave in and out of traffic, follow the car in front of them too closely, or otherwise put themselves and others at risk of injury. Inexperienced drivers. New drivers, who are typically teenagers, lack the road experience of older drivers and may cause serious crashes. Additionally, teens may be distracted behind the wheel. Special graduated license laws apply to drivers under the age of 18. Older drivers. Senior citizens may have more driving experience than other drivers but may experience medical conditions or slower reflexes that impact their driving abilities and cause crashes. Poor driving conditions. Poorly designed or complicated roads, or roads that are impacted by weather conditions, can create difficult driving conditions and result in crashes. Of course, anytime a driver is negligent or careless a serious accident may result in injuries. Brain injuries. The brain may be injured in several different such as when it is bruised, it bleeds, it tears, or it swells. Any of these injuries can be life-threatening. Even when an accident victim survives a brain injury, they may have long-lasting problems associated with the head trauma. Spinal cord injuries. Spinal injuries can range from causing minor irritation to an accident victim’s death. A spinal cord injury is the most serious and can cause partial or full paralysis or a loss of function or sensation below the injured portion of the spinal cord. The most severe cases of spinal injury can cause the loss of life. Broken bones and other orthopedic injuries. Orthopedic injuries are the most common type of injuries found in car crash victims. They can range from any bone break or fracture, strained or sprained muscles, or torn ligaments and tendons. Though not always life-threatening, a broken bone, fracture or other injury can be very serious, and result in a lifelong disability. Amputations. An amputation may occur at the scene of the accident or later because of an infection. Whether it is an arm, hand or finger, a leg, foot or toe that is amputated, the injury is severe and life-changing. Burns. During an auto accident, victims may incur either thermal burns, affecting the skin, or burns that affect the airway. Burns to the airway can occur when inhaling smoke, toxic fumes, or superheated air, all of which can be present in an auto accident. Thermal burns occur when flammable substances released from the vehicle or from a spilled cargo load ignite, burning everything in their path. The road to recovery is long and painful for burn victims. Depending on the severity of the burn, a full recovery may not be possible and the injured party may suffer lifelong complications. Mental and emotional trauma. Car accidents are the leading cause of PTSD in Kentucky. Death. Many of the injuries described above can lead to death. Each year hundreds of people die on Kentucky roads while thousands of loved ones mourn their loss. Medical expenses. All healthcare-related costs, including surgeries, hospitalizations, medications, doctors’ visits, physical therapy, and other expenses may be included in your recovery. Lost income. All of your lost income may be compensated. This includes any income you earn from being self-employed or that you earn as an employee. It includes any reduction in your income because of your accident injuries as well as a total loss of income if you can’t work at all. Lost benefits may also be compensated. Out-of-pocket costs. Any expenses that you incur because of your accident injuries may be compensable. This could include things such as alternate transportation costs, child care costs, and help around the house. Physical pain and emotional suffering. Your physical pain and emotional suffering may be your most significant car accident injuries. While money is an imperfect way to compensate you for these losses, it is the only way to do so and it may make your recovery easier. Additional damages may be possible in a car accident wrongful death case. Getting medical help. You will need to prove that the car accident caused your injuries. Accordingly, it is important to get prompt medical help to prevent your injuries from worsening, to manage your pain, and to protect your legal rights. Refusing to give a recorded statement or sign documents provided by the insurance company until you have spoken with your own attorney. Anything that you say to the insurance company may be used against you. Collecting the necessary evidence to support your claim. This could include photographs, witness testimony, police reports, and evidence gathered through interrogatories, depositions, requests for production of documents, and other legal discovery methods. Understanding how insurance settlements work. A fair insurance settlement will not be offered to you unless you take action. This may include a formal demand letter and include skilled negotiations. Contacting our experienced car accident lawyers. You have the right to work with a lawyer who cares about your recovery and who isn’t afraid to fight for your rights. You have a limited amount of time to file a case. In most cases, the Kentucky Statute of Limitations gives you only one year to file a personal injury lawsuit, although some exceptions do apply. If you fail to file your case before the statute of limitations expires, then your recovery will likely be barred. Whether you have legal standing to file a case. You may file a lawsuit if you have been hurt, if your minor child has been injured, or if you are the personal representative of someone who has died in a crash. If your actions during the accident will impact your recovery. If you were partly to blame for the accident, then you may still be able to recover damages in some circumstances. Learn more about Kentucky's comparative negligence law. How and when to formally begin a lawsuit. A lawsuit begins when a complaint that meets all of the legal requirements is filed in court. All of this can be confusing—but it’s important to your recovery and you don’t have to do it alone. Our attorneys and staff nurse know how to investigate complicated car accident cases. We are dedicated to the recovery of each and every client we represent and, if you’ve been hurt because of someone else’s negligence, then we will fight hard to get you the compensation you deserve. Insurance companies rarely take car accident victims seriously unless they are represented by counsel. If you or a loved one has been seriously injured in a car accident in Kentucky, please do not hesitate to call the Louisville auto accident lawyers of Gray and White Law at 1-502-210-8942 or 1-888-450-4456 (toll-free) for your FREE CONSULTATION as soon as possible. ?Can I file a wrongful death case if my loved one died in a vehicle ejection accident? ?Will I have to reimburse my health insurance company for paying my medical expenses after a car crash injury? ?What kind of knee injuries can result from a car crash?